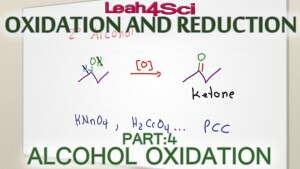 Alcohols can be oxidized to aldehydes, ketones and carboxylic acids. The specific product will be determined by the substitution of the starting alcohol, and the specific oxidizing reagent used in the reaction. This video will show you how to identify the oxidation products (or lack of) for primary, secondary and tertiary alcohols.